Perseid meteors streak across the sky early August 12, 2008 near Rogers Spring in the Lake Mead National Recreation Area, Nevada. The meteor display, known as the Perseid shower because it appears to radiate from the constellation Perseus in the northeastern sky, is a result of Earth's orbit passing through debris from the comet Swift-Tuttle. Tuesday morning was considered the peak of the shower, which is visible every August. There will be a cosmic show in the night sky Wednesday night, if you can stay up late enough to see it. 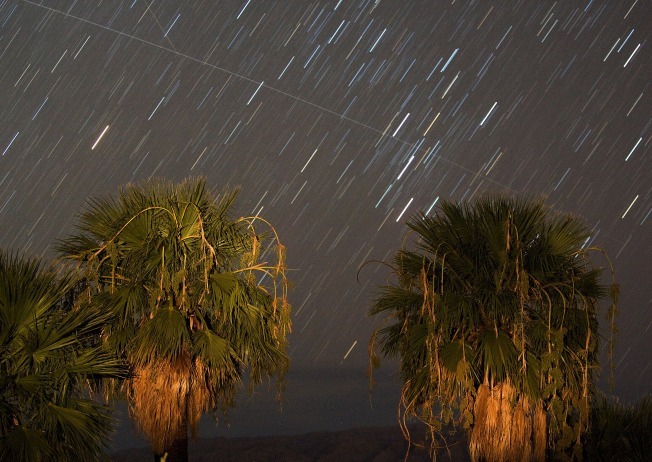 The Perseid meteor show hits its peak this week and tonight is a prime night for stargazing. You may even see a meteor a minute. The meteors are a result of the debris of comet Swift-Tuttle discovered during the Civil War in 1862 by Lewis Swift and Horace Parnell Tuttle. The largest concentration of Perseid meteors will move through our atmosphere this afternoon but Wednesday night should be a good show according to National Geographic. The shower will appear to radiate from the constellation Perseus. To watch, pack a blanket, bug spray, and snacks, then lie on your back away from city lights, with a view of as much of the sky as possible. Look for the shooting stars to streak out from the northeastern sky to points across the sky, especially at and after midnight. Nasa also offers a map of where to look to see the meteor shower. Tonight isn't the only night to see the meteor shower, it's expected to continue for at least a week. If you do stay up late and witness the meteor shower, snap a picture and send it to isee@nbcdfw.com. But be quick, experts say the meteors streak across the sky at about 132,000 mph. If you can't stay up late, the next meteor shower – offering hundreds of shooting stars an hour -- will come around in December when the Earth passes through the Geminids.